With growing interest in the role of endophyte to the host plant ecology, health, and productivity, this chapter discusses seed-inhabiting endophytes. These endophytes were less recognized when compared with those found in the other parts of the plant. However, they cannot be ignored as they are the first one colonizing young seedlings and further determining the fate of the plant. These endophytes often have potential to improve seed germination and seedling growth. Recent advances in seed endophytes have proved that they can confer stress tolerance to the host plants, especially the heavy metal resistance. Microbial dynamic equilibrium with plant systems is vital for the germination, growth, and reproductive phases of plant life cycle. The colonization and transmission of seed endophytes suggests that host plants select an endophytic community having beneficial traits that can be passed to successive generations. 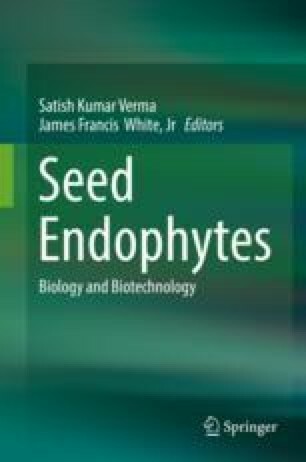 Seed endophytes can facilitate the improvement of seed quality and plant growth of agriculturally important crops via different biotechnological applications; they have prospects in endophyte-mediated phytoremediation applications.